With reports of 2.5 million Syrian refugees now encamped in Turkey, this 19th century print of refugees in Constantinople (Istanbul) shows that massed refugees in that part of the world are not a new phenomenon. Latin Hospital, Pancaldi near Constantinople: refugee dispensary. Wood engraving, 1878. 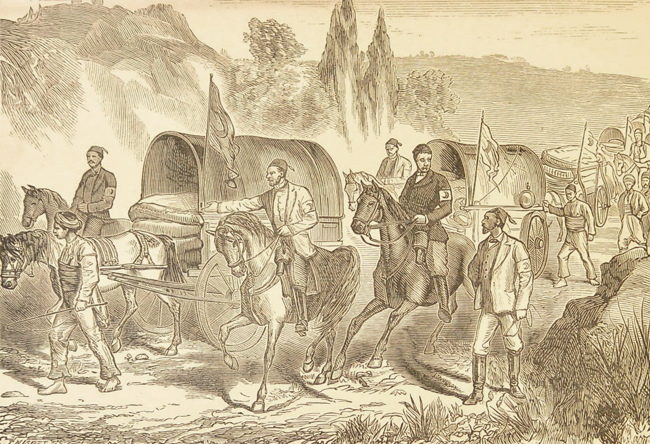 The image, part of an article from the ‘Illustrated London News’ (27 April 1878 issue), is about refugees from the Russo-Turkish war of 1877-78. This clash of empires – the Ottoman and the Russian – impacted the entire population of the Balkan peninsula. But whereas today’s refugees are Syrian civilians moving West into Turkey, in that conflict the majority of refugees were moving East out of Europe into Asiatic Turkey. The refugees were mainly Muslim (and Jewish) civilians escaping the Bulgarian and Balkan warzone). 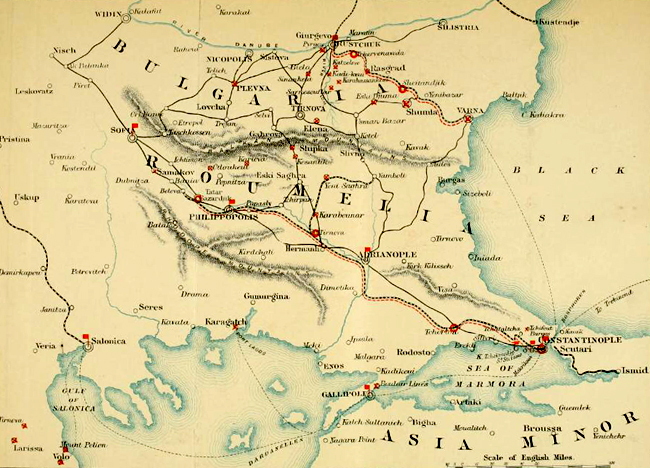 Map illustrating operations of the Stafford House Committee in European Turkey, 1877-1878. From the Report and Record of the Stafford House Committee for the Relief of Sick and Wounded Turkish Soldiers. 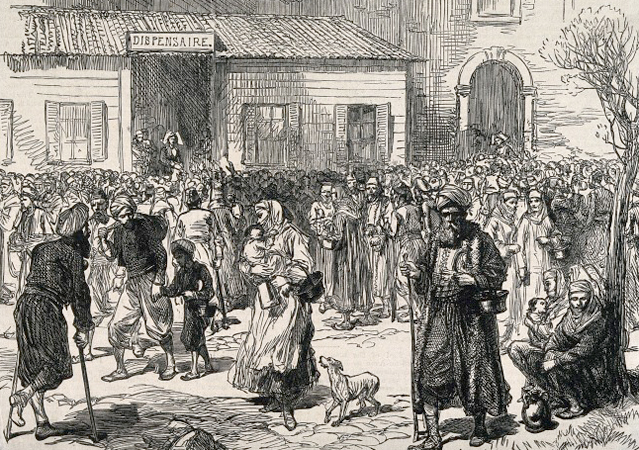 Another outcome of the Russo-Turkish war was the emergence of the Red Crescent, created to provide medical aid to for the Ottoman troops.The Illustrated News article mentions international relief efforts with “funds supplied by several International Societies of Relief… helping the immense crowd of refugees with medicines and provisions”. One of these organisations was the Stafford House Committee for the Relief of Sick and Wounded Turkish Soldiers, which sent medical staff to work with Red Crescent ambulances. Red Crescent ambulance No. 5 on its way to the front. From Under the Red Crescent by R B Macpherson. ‘Under the Red Crescent, or, Ambulance Adventures in the Russo-Turkish War of 1877-78‘ is a book by R B Macpherson, one of the doctors sent out by the Stafford House Commitee. As the title suggests, it is more of a travel journal than a war report, with some beautiful line drawings of the people and places that he encountered. “Large numbers of their oxen died and at frequent intervals we would come upon their carcases lying by the roadside being torn to pieces by the savage mastiffs….Clothed in rags, short of food, and having to sleep our without adequate covering night after night….Fever was rife among them, and the old men and women and the children were cut off in large numbers by the exposure. The numerous freshly-made graves by the roadside testified to their sufferings”. R B Macpherson in ‘Under the Red Crescent’. Upon reaching their destination in Constantinople, conditions for the refugees were little better thanks to “the numerous refugees who crowd the city and its suburbs”. All the mosques in the city were turned into refugee camps. The Illustrated News article describes the scene: “The mosque of St Sophia is, like most of the others, now the home of a great mass of these people, estimated… at 3000 souls. On the ground floor every available inch of room is covered with them”. The journalist contrasts the opulent interior of St Sophia with the condition of the people now housed within: “The architecture is always grand; there are the same wonderfully rich-hued columns and alabaster walls, the same gold and mosaic ceilings’ but with the motley and interesting assemblage of people now crowding every corner”. “There is absolutely nothing to do but to gossip and smoke” he notes. 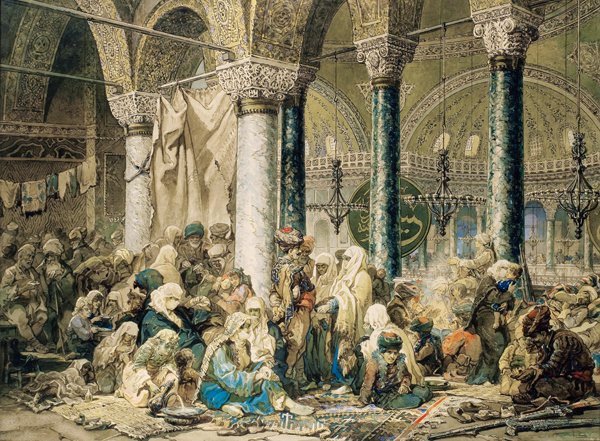 “After Amadeo Preziosi – Refugees in the Gallery of the Mosque of Hagia Sophia (St Sofia)”. Image credit: Gandalf’s Gallery. The warm weather and overcrowding meant the threat of disease was ever present. Writing from Constantinople in March 1877, Mr Barrington-Kennett warned that “Typhoid fever and smallpox are raging among these poor people and nearly all places of refuge, especially the great mosques, are at present literally transformed into a hotbed of infection.” and the diseases are “finishing the work which exhaustion and exposure began; and many have made the weary march to die at last in peacefully”. 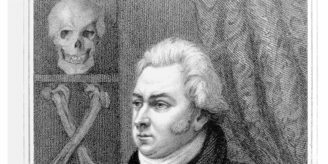 The doctors did what they could “searching for all the cases of smallpox and typhoid among the masses of people huddled together”. The Illustrated News concludes: “The condition of things in Roumelia does not look helpful for a peaceful reception of these people should they return to their homes unescorted.” Then as now, the prospect for many of the refugees was bleak. World Refugee Day is on 20 June. 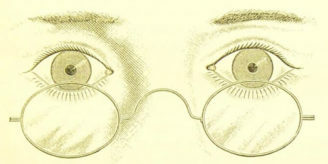 What did the Victorians make of spectacles?